The City Council Election is May 10, 2005. Voter Registration Deadline is April 11, 2005. Follow-up: Judge Contillo denied the relief sought by Calvin Coles and essentially upheld Councilman McAuliffe's appointment. More details tomorrow. Hey Worried, I think you're going to have a lot of company this spring. The first ticket to surface is intriguing but worrisome indeed as these elections are always about popularity, not substance. Hidden agendas abound here...perhaps the competition will provide more choices and for the first time a full slate getting in could really be in jeopardy. Let's all be sure to thank Hurwitz for bringing the dems into the fray although I believe there is one token republican on the ticket. Seems she'll genuflect to the demi-god Ferriero at any opportunity. But what's particularly troubling is the notion that somehow our present city and council somehow support this. After all those years of relatively good service, the residents of Hackensack deserve better. I think it incumbent upon them to at least attempt to put together a slate that best serves the citizens. If they want to move on after so many years so be it. But for the all that have supported them over the years - is that all there is? It's no secret that Mayor Zisa is poised to be our next City Manager (when he's ready and on his terms), Stein's got his job with the county leaving us with perhaps the only real intellect left on the council, Mr. Mattei. Hopefully he won't desert Hackensack and pull together a meaningful cast. In any event, it will be interesting...and look on the bright side - we might even get to see Mr. DeFalco attend something other than a sporting event and our kids will get Carvel for lunch! I think its inappropriate to be picking apart this new ticket right out of the gate. We should be encouraging people who are trying to do right for the City. Today, let's applaud them for taking the initiative to run. Tomorrow, there will be time to see where everyone stands on the issues. It is real easy to sit around with the remote in one hand and a can of beer in the other and take shots at people who are trying to serve the community. Hammer, you're entitled to your opinion but I think your insult toward Ms. Hurwitz was wrong and unnecessary. I'm debiting karma from your account. Read more about the new Karma feature here. Is there a potential conflict of interest with th HS principal running for mayor? I certainly do not doubt his experience and community service to the city. This council ticket is very pro - BOE. The city manager is a former BOE member too. Without seeing any agenda from any ticket running, my mind is open, but I have reservations regarding the BOE, its budget and annual tax increases. Does the city have any influence with the BOE budget and spending? Which party ticket is going to discuss the upcoming tax reassessment? I'm convinced its one of the reasons the current mayor's ticket is stepping down. Tax reassessment is political suicide. With yesterday's Record headline article on the state budget - this year will be the year of tax increases! There is just over a month to go for the city council election and the residents have no idea who's running against who and what the issues are. And people wonder why on 11% (I seem to recall) of the city population voted last time. The following is an opinion piece that appeared in the March 8, 2005 edition of The Record. 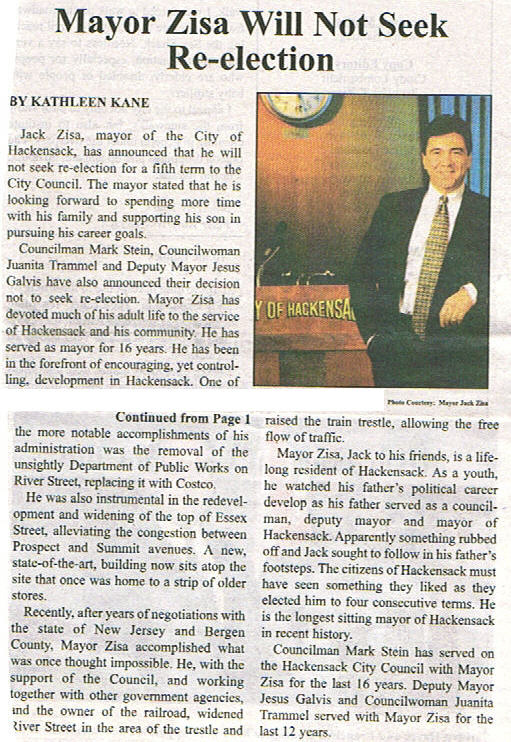 The Record's description of the slates that Hackensack Mayor Jack Zisa and his City Council allies have run on as "bipartisan" is unfortunate ("Zisa won't run for reelection," Page L-1, March 2). Like several other Bergen County municipalities, Hackensack has a non-partisan form of government, as well as non-partisan elections. This is not an unimportant distinction. Bipartisan coalitions are, by their nature, temporary arrangements that eventually yield to purely partisan politics. The ideal behind non-partisan government is to keep party politics out of such things as hiring people to fill potholes. It doesn't guarantee integrity in government, but the ideal is worth preserving, especially in a time of extreme partisan heavy-handedness at the county level. Although I do not live in Hackensack, I am troubled to read that a new slate for Hackensack has been "put together" by the chair of the Hackensack Democratic Municipal Committee ("Two from Zisa ticket opt out of race," Page L-1, Feb. 25). I hope this is not an indication of things to come. Non-partisan government in Bergen County appears to be in the cross hairs. If Hackensack falls, can Teaneck be far behind? 1. there shall be no more influence peddling to the mayor and council by ANY individuals albeit special committee members of economic development or otherwise who may profit by council decisions. 2. The mayor and council shall not be invested in real estate or projects within the city that may benefit them or their families in part or whole or any LLC or corporation where they hold member shares for their term; and for a period of seven years thereafter term where any decision effects an investment held or in process of transfer. Developers, investors, realtors, contractors, who operate within the City of Hackensack, or business or property owners who may be a potential conflict of interest; and that as such, must be disallowed involvement in any area where potential conflict exists. b) HEDC Must have a proven background or education beneficial to the progress of their. c) All members should ultimately be employed in non-conflict areas of profession and should bot have businesses which are located within the city. With respect to the last post, please be aware that directory assistance (411) has no record of a Manobianco in Hackensack. There is no listing of Umberto Manobianco in New Jersey. I suspect it is a fictitious name. Since we all know not everyone will attend a debate among candidates, why not include absentees with access via the web? WebEx or GoToMeeting have the capability to provide real time presentations, online video / audio. Questions could be fielded thru the online session as well by email or chat. The political parties can easily cover the cost of the online sessions. With the use of our Middle School or High School auditoriums and studios, the audio and video needs can be addressed. The HS has a computer / technology club, that would probably jump at the chance to help. The entire broadcast could be recorded and provided as a resource on this web site or shown on the school cable channel. There is still plenty of time to plan this and reach out to more residents. Residents that are not comfortable attending a public meeting or physically unable to would have another choice. I am sure there are other options, but these two are the leaders. Note: This post should not be construed as an endorsement of any candidate. The other slate running is "Community and Recreation." This ticket consists of Freddy Jones, a salesperson and Weona Mercedez Dean, a founder of New Jersey's "Juneteenth". I am reading in these posts evrything buth what I want to know. Perhaps sombody can send me an email telling me where I might find a list of of indiavidual candidates veiws, promises, visions, changes, and ticket goals for the various issues of interest to Hackensack.